Japanese love Disney and Disney products, so when it comes to their version of the Happiest Place on earth, it is a game-changer. 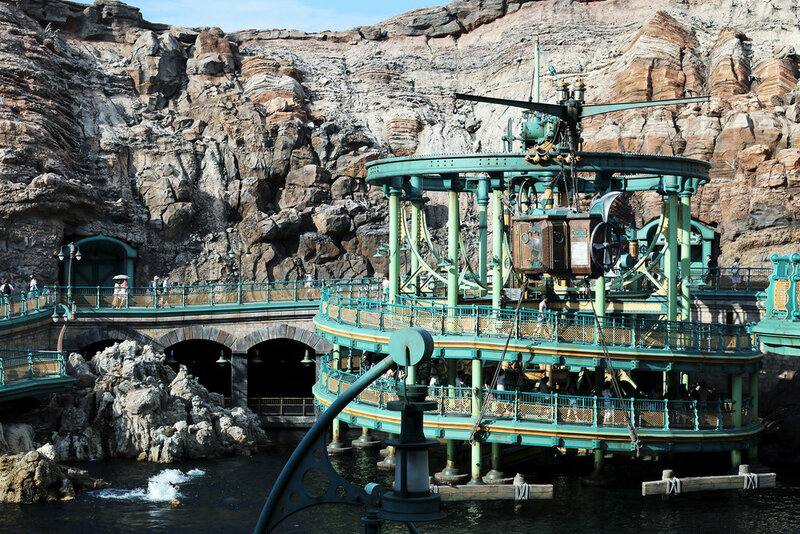 If this is your second trip to Tokyo, then the DisneySea park is an irrefutable must-see. And plan for the whole day, because you need the entire day to truly experience all the wonders it has to offer. Word of advice: get up early! I am not a morning person, but for DisneySea I get up before the sun is up to try to make it right for the opening. It gives me a chance for a shot at the fastpass for my top favourite rides. Japanese take their fastpass game seriously, and some of the most popular rides close their fastpass booths in just mere 15 minutes! 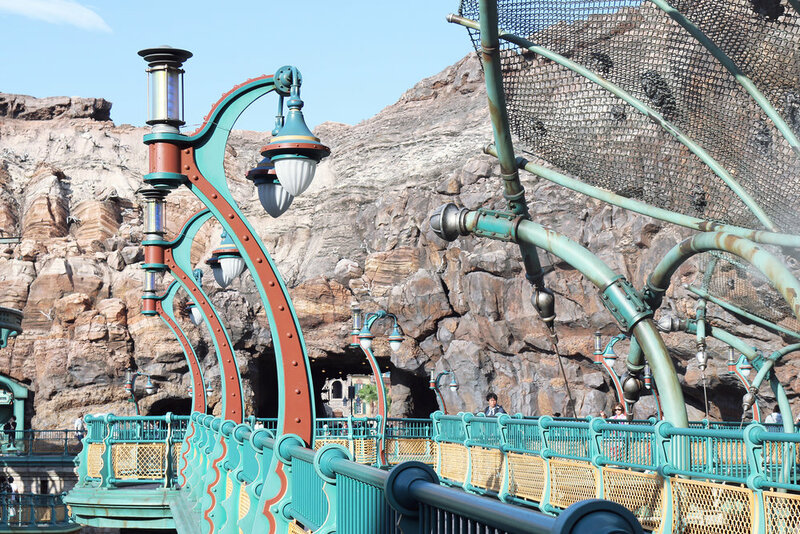 So what’s so special about DisneySea? Isn’t it just like any other Disney theme park? Well, yes and no. And here is why this one is special to us. Hidden and isolated within the towering Mt. Prometheus rock walls, Mysterious Island is a magnificent tribute to the classic Jules Verne’s adventure novels. Set in the futuristic 19th century setting, this part of the park is a true steampunk heaven, transporting you into the age of new discovery and exploration. The design elements in details are stunning and awe-inspiring. Situated on what seems to be a man-made construction above the sea within the volcano, Mysterious Island is ready to take you on the adventures of exploring the earth’s core and the deepest depths of the sea. 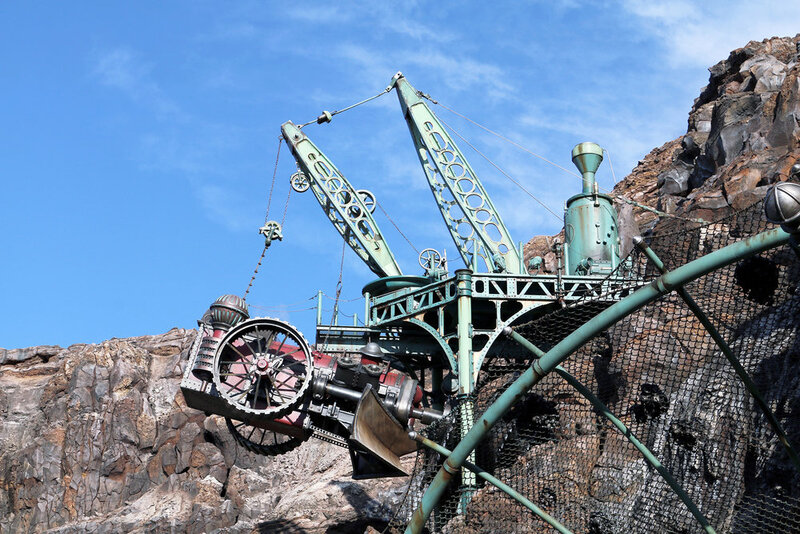 Take an excursion on the Journey to the Center of the Earth or the 20,000 Leagues Under the Sea—two of some of the best and unique rides that Disney park has to offer. Click to view the Mysterious Island panoramic shot. The DisneySea theme park’s architectural design is beyond beautiful. It’s iconic, vibrant, magical structures against the backdrop of the shimmering water canals and colourful cast members alongside park’s personnel in character uniform are what brings the magic to this park. It’s all in the details. Even the dustbins are a work of art! And if you love photography, DisneySea gives you a hella playground to play in! American Waterfront is filled with the passion of the roaring 20s. The details in the grunge meets glamour architecture, the energetic atmosphere, the colourful early century rolling motor vehicles, and even the 20th-style department store decor inside the souvenir shops—everything transports you back in time. 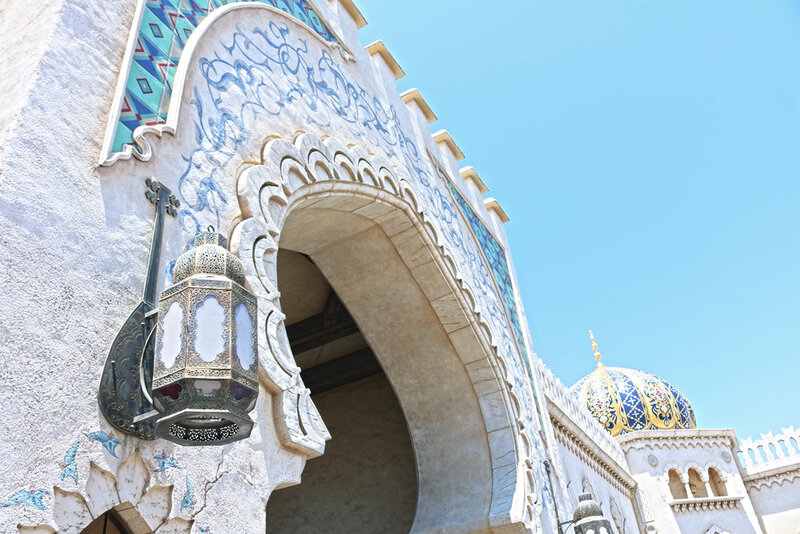 Arabian Coast’s magical rooftops, narrow streets, and colourful persona gives you a sense of an exotic backpacking adventure in a land of stories as old as time. 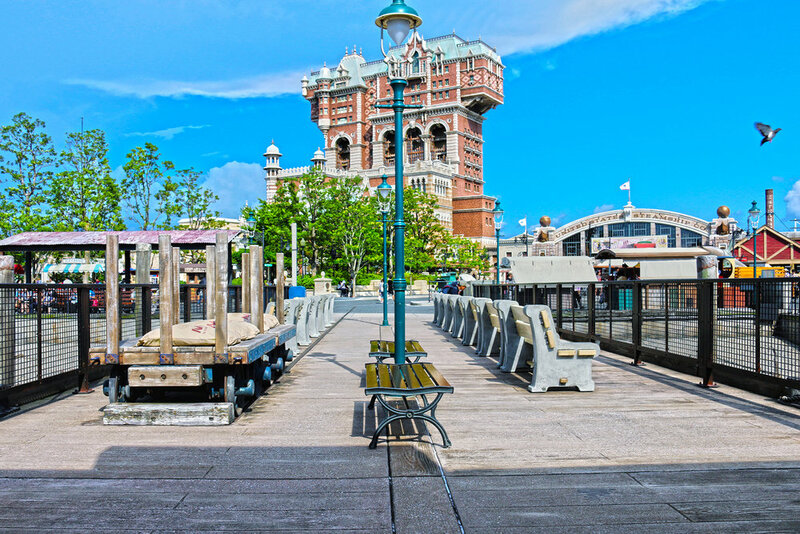 The DisneySea, in comparison to other Disney parks, has a laid-back sort of vibe. It feels like a place where you can slow down, chill out, and simply enjoy the scenery. There are times when we visit and only go on one or two rides, yet it never feels like we are missing out. Coming here even if just to enjoy the scenery and good food is more than enough and absolutely worth it. Speaking of food and chilling out, did you know they have beer and other alcoholic beverages in the park? Between the two Tokyo Disney parks, DisneySea is definitely geared more towards adults and couples. There are of course kids present, but in comparison to Tokyo Disneyland, there are not a lot of them here. 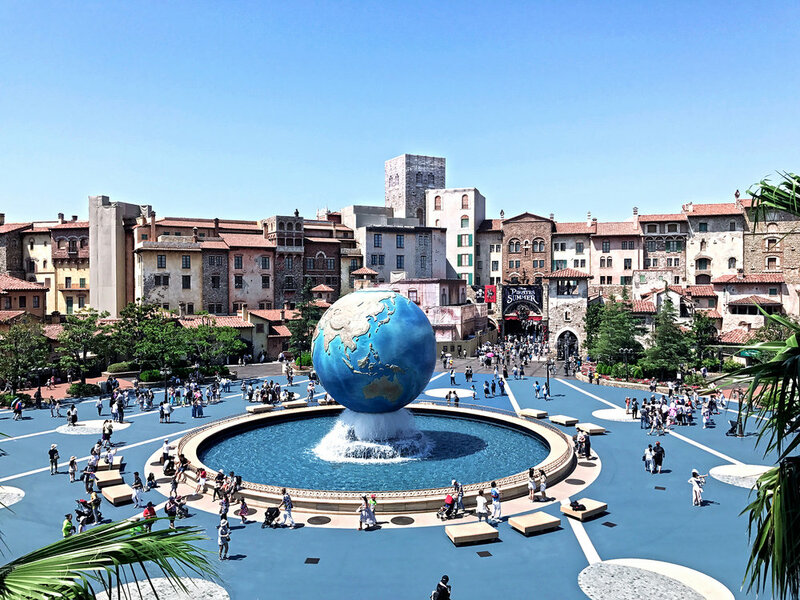 So if you feel like you might be too old for a theme park, don’t fret as DisneySea seems to have been designed with the mature audience in mind. On our recent trip to DisneySea this month there seemed to be a new fashion memo that unfortunately we didn’t get. It seemed like most of the couples and even groups of friends were all dressed in matching outfits! No, I am not talking about matching Disney t-shirts that you can buy at a gift shop and put on to blend in. I am talking about full on matching clothing. There’d be pairs, groups of three or five, couples, and double dates all dressed in matching clothing. All-girl groups, I am sure, had an easier time coordinating. However, my favourite ones were the couples and their creative ways to match each other’s ensembles. At first I wasn’t sure about this fashion movement, but as the day went on I found something intriguing about it, and even began to feel left out. Well, there is always next time. Here is a well matched couple. Let’s just say snacking in DisneySea is what it’s all about. Their snack game, or specifically popcorn game, is crazy good! From the moment we stepped onto the park’s grounds till the end of the day I had a popcorn cup in my hand. Can you blame me? There are caramel, chocolate, white chocolate, salt, and my favourite black pepper and curry flavours, to name a few! Oh, and don’t forget that there are also special seasonal limited edition flavours throughout the year. Other than popcorn, you’ll be sure to find churros, mountain of ice cream, smoked spicy chicken, smoked turkey legs, and other classic street food scrumptiousness. This was my highlight drink of the day: the sparkling mango juice with tapioca and jello. Not one bubble out of place! I would go back in a heartbeat just to have it again! There is literally something for everyone! I, myself, not much of a roller-coaster gal. And having acrophobia often leaves me left out at attraction parks. Not here though! Here there are great attractions for all ages, heights, and fears (or lack of them). If you are a thrill seeker, then Tower of Terror, Raging Spirits, and Journey to the Center of the Earth are for you. 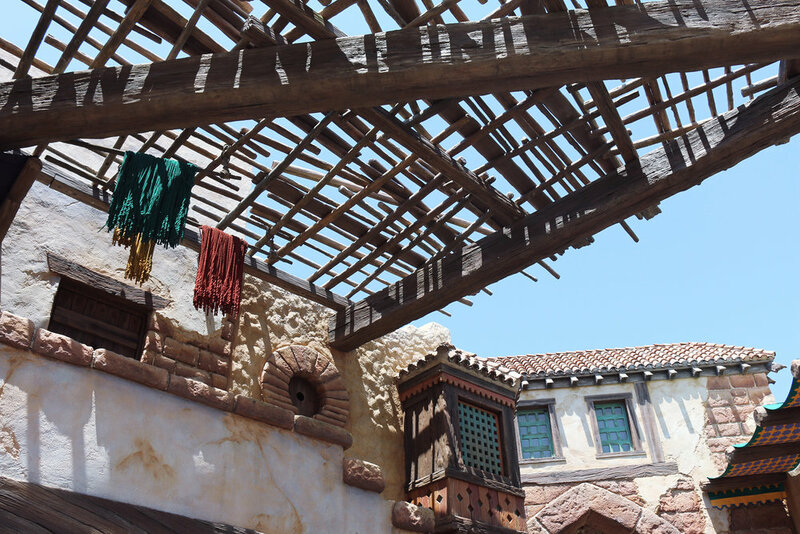 And if you are like me, who loves the excitement of a fast ride, but without the free-falling aspect, then try the Indiana Jones Adventure: Temple of the Crystal Skull or the Toy Story Mania!, which is just plain old-fashioned fun! For the little ones, Mermaid Lagoon is packed with smaller kid-friendly rides. But don’t worry, there are plenty of adults like myself who are more than happy to stand in line to ride the Whirlpool—the Little Mermaid themed classic teacup ride. A heavenly cooling mist on a hot summer's day. Warning: You do get wet! I’ve never seen anyone save a spot for a parade hours before it happening at a theme park, except in Tokyo Disney parks. And I can see why. The parades here are beautiful and awesome. And if you stay till the end of the day, there is the Fantasmic! nighttime light show on the water, and a grand fireworks display to round off the day. Pirates Summer Battle "Get Wet!" Literally pouring water over the audience. If you are into shopping, or maybe just browsing the store merchandise, DisneySea will not leave you disappointed. Japanese take consumerism seriously. 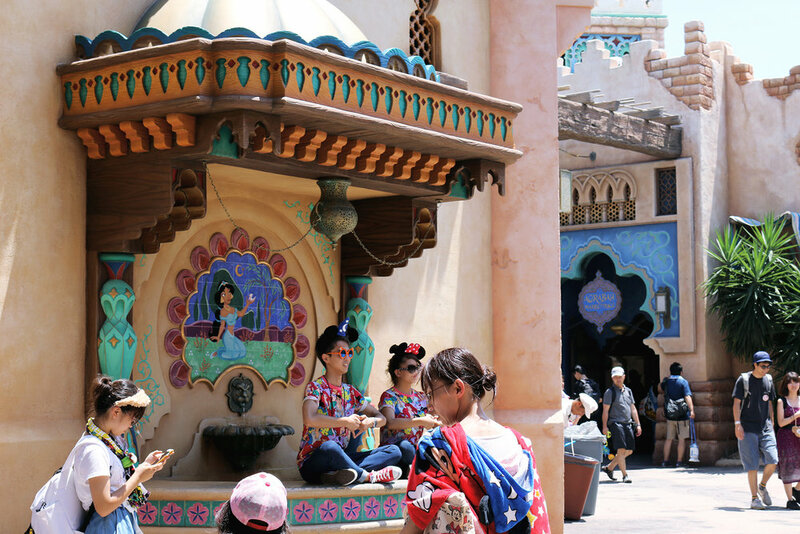 And it is not a surprise that at DisneySea they are truly great at it. Here you’ll find an amazing collection of some of the best Disney merchandise I have ever seen. Some are unique, beautiful, and eclectic. And some are sold exclusively only at a handful of Disney theme park stores around the world. Yes, I am talking about Duffy, the Disney Bear, and it’s recently newly added friends. Or my personal favourite, Disney themed Tomica cars. There are Disney stores around Tokyo, but most of the time the merchandise sold at the park is exclusive to the park. So if you like something, know that you might not find it again after you leave the DisneySea grounds. Final word: It was an extremely hot sunny day. But thankfully being located at Tokyo Bay, at times it was also quite pleasantly windy. Yours truly. Trying to keep the wind from messing with my hair. The first day of this year’s Spring Festival fell on a Saturday, flooding Yokohama’s Chinatown—Japan’s and Asia’s largest—with a sea of people. On this warm, sunny weekend many came out here in hopes of observing the lion dance, an auspicious traditional custom that brings luck and prosperity to its benefactors. We have seen plenty of lion dances in Toronto’s Pacific Mall, where the crowd always seemed manageable. We weren’t prepared for this though. People flooded the streets. And despite the audible rhythmic beats hinting that a lion dance was going on right around the corner, there was no way to see or come close to it. Patiently waiting, we stayed put, enduring the pushing and pulling of the crowd in order to be able to snap a couple of shots of the lion’s head. I was beginning to feel like a real paparazzi here. This is the first time I really envied the fellow avid photographers, who came prepared with an extendable tripod allowing them to observe and record everything from above. After what seemed like forever, my hands were starting to give in, and I finally began to feel the full weight of my SLR. At this point I noticed that whenever the lion’s head became slightly visible, smartphones bloomed above heads. This is when I knew it was my cue to prop my camera up as high as I could above everyone. However, my height being somewhat average here mostly got me some artsy photos of cellphone screens. I did get that lion at last! A testament to endurance and will! Behind us we suddenly heard an extraordinarily loud popping as the air began to fill with smoke. It took me a minute to realize what just happened. Firecrackers! It might sound childish, but it was so cool! Come to think of it, it was the first time I saw firecrackers live. At that moment I truly felt like a kid. Hungry from excitement, endurance, and perhaps a very light breakfast, we beelined to a shop right nearby specializing in fried xiaolongbao or shouronpou (小籠包) as Japanese like to call it. Fried xiaolongbao is somewhat a popular delicacy here, with many shops competing for customer patronage. The closest one claiming to be number one and well loved by TV programs looking for best eats around the town was our first victim. Famished and nostalgic for the meaty dumpling soup goodness, we got ourselves the nikuman (肉まん, meat buns or bao) and sesame covered fried xiaolongbao. The result was heavenly. Heading back outside we heard the music again. The crowd thickened. This is when we knew that we got a second chance at catching the lion. And this time we were right in the middle of the happening. Success! The lion in all its full-bodied beauty! Feeling full and happy with our accomplishments, we continued along the streets of Chinatown, along the steady crowd, firecracker smoke, and colourful architectural sights. Got another lion along the way! There were many kids, but this is the only one that caught my eye dressed in all her festive attire. We took a turn into one of the narrow back streets, feeling transported into a whole new, yet visibly aged, side of Chinatown not seen directly through the gates. At dusk the streets began to dance with light. The brightly and colourfully lit up shop signs and the overhanging lanterns illuminated the dark crowded streets. It really reminded me of the Hayao Miyazaki’s scene in Spirited Away, when Chihiro just lost the sight of her parents in an odd seemingly abandoned town that as the sun set lighted up in colours of lit up lanterns, filling with spirit and lively chatter. Here people began to crowd around food stalls and side shops, munching on the savoury goodness Chinatown was eager to offer. Lined up ducks at this fancy place specializing in Peking duck dish. Will definitely pay it a visit one day. One of the stores had this cute display. One more firecracker display caught on camera. I think both firecrackers and fireworks are something magical. No matter how many times you see it in your life, it always brings you back to childhood, making you feel like a kid all over again. The day was coming to a close, so we decided to have a parting meal featuring another set of those delicious fried xiaolongbao. This time we tried another vendor priding itself on being featured on Japanese TV. Its staple set of three kinds of fried xiaolongbao was beyond amazing—a great parting meal! The weather in Tokyo this winter has been more than agreeable—sunny and warm—perfect for an odd stroll around the city. It has been over a year since I got to catch up with one of my good Japanese friends, so we decided to meet up and do a little walking around Shibuya / Setagaya areas. We chose to stay away from all the hustle and bustle, and take on a route along the quiet streets of Shimokitazawa and Sangenjaya instead. Shimokitazawa (下北沢), or “Shimokita” as the locals like to call it, is a short ride from the boisterous touristy Shibuya station via the Keio Inokashira line. Full of narrow streets packed with the indie second hand shops and fashion outlets, quirky cafés, bars, art scene, and music venues, Shimokita has that Harajuku feel, albeit less crowded and noisy. 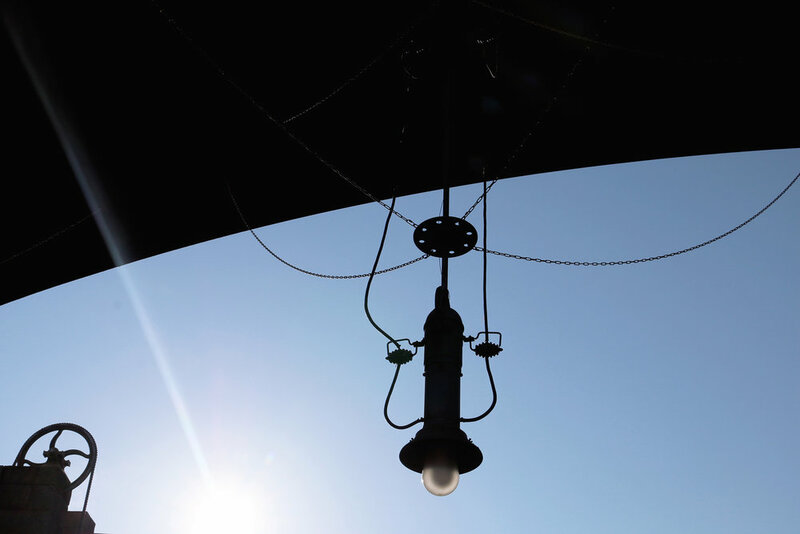 Its architectural essence feels organic, tangled by the chaotic interweaving of the narrowing streets, boasting its eclectic storefronts and its notorious laid-back vibe. Sangenjaya (三軒茶屋), on the other hand, located in Setagaya, is a 30 min walk from Shimokitazawa on the south end of Tokyo. In history Sangenjaya is known as the quiet rest stop frequented by the travelling countryside folk before entering the old Tokyo city, thus earning its name, lit. translated as “three tea houses”. Locals also began to call it “Sancha” for short, meaning “three teas”. It is a tightly knit old Tokyo neighbourhood community, filled with old-style traditional wooden houses, small cafés, restaurants, and peculiar old shops nestled along the narrow quiet tree lined streets. Pancakes at a recently opened pancake café, Flipper’s, in Shimokitazawa. We began our day around noon over a delicious spread of Japanese pancakes at a small café minutes away from the Shimokitazawa station. Shortly after strolling among the small shops in the area, we decided to start our pilgrimage towards Sangenjaya. It was an exceptionally sunny and warm day for January, so we were eager to start our walk. This is when my travelling companion suggested we start in the direction of the nearby Shinto shrine, the Kitazawa Hachiman Jinja (北澤八幡神社). It is a quaint hillside Shinto shrine, about a ten minute walk from the station, nestled among the towering trees and narrow winding roads. Beautifully adorned in brightly coloured carvings, the temple emanated warmth and tranquility. Built more than 500 years ago in the Bunmei era (文明, 1469~86) putting the area under divine protection, the shrine consists of the main hall building, and a number of adorned miniature side shrines along its grounds. Daruma-san overseeing the Kitazawa Hachiman Jinja. The Chinese zodiac animals outside the ground keeper's building. As we approached the main building and made our prayers, my companion suddenly took out a small notebook and proceeded in the direction of a small tucked away building, where she rang the bell. As the grounds keeper opened the door, she asked for a “goshuin” and promptly handed over the notebook. At this point my curiosity took over, and I began to ask as to what exactly was going on here. What I didn’t know, is that I just stumbled upon one of the Japan’s best kept secrets. Goshuin (御朱印: 御 (go or o, honorific syllable added at the beginning of certain words); 朱 (shu, red/orange ink: vermilion colour often seen at Shinto shrines); 印 (in, stamp)), “the honourable red stamp”, is a seal stamp received by worshippers visiting the Shinto shrines and Buddhist temples around Japan. The shuin are created by stamping the unique shrine or temple seal and then writing a messages around that seal using an expert calligraphy technique in black ink. These seal stamps are traditionally made by the 神主 (kannushi, Shinto priest) or the Buddhist monks, and usually cost about ¥‎300. These stamps are collected in a small specialty book called goshuin-cho (御朱印帳), which can also be purchased from the shrines and temples themselves. The paper in the book is folded in accordion style, allowing you to open all the pages at once to reveal the gorgeous calligraphy design compositions. Honestly speaking, I think it is a genius idea for a very personal keepsake from Japan. It is something that can only be acquired through one's travels to these shrines, which also makes it an amazing souvenir to bring home for that someone special. Excited about the prospect of getting more goshuin stamps, we decided to plan our walk so that we hit the next temples or shrines on our way to Sangenjaya. Avoiding the main streets and the traffic, we continued to walk deeper and deeper into the neighbourhood, taking in the sites of the old and the new Tokyo residential architecture. In mere minutes we hit the next temple: Ensen-ji (円泉寺), located right in between the two stations. It is a beautiful quiet temple featuring the many iconic Buddhist temple treasures. Dating back to the late Nambokucho period (南北朝時代, Nanbokucho jidai, also known as the Northern and Southern Courts period, from 1336 through 1392), this temple was designated as No.51 of the Eighty-eight Holy Places of Tamagawa (the 88 temples along the Tama river). Statue of Kobo Daishi (弘法大師修行像, koubou daishi shugyou zou, high monk of ascetic practices statue), (posthumous title of Kuukai) as a Wandering Ascetic. Tanuki, a Japanese raccoon dog, a popular icon in Japanese folklore and proverbs. Kosodate Enmei Jizou-son (子育延命地蔵尊), the Child-rearing Jizou of Longevity), made in 1791, noting the popular Jizou worship in the area. Jizou is a bodhisattva, who looks over children, travellers, and the underworld. A small Tanuki hiding on the side of the Kosodate Enmei Jizou-son shrine. Leaving the temple we began to close in on the Sangenjaya area. The streets got narrower. The houses got older and denser. The small iconic food shops began to appear around every corner. The streets began to fill with clamour. Walking through the main central shopping area jammed with small eclectic shops, we finally came across our last and final Buddhist temple spot for the day: Saisho-ji (最勝寺). Built in the beginning of the 19th century, the Saisho-ji consists of very spacious grounds featuring the main building, a narrow street of closely built adjacent buildings as well as a small cemetery, located just minutes away from the Sangenjaya station. On the way back to the Sangenjaya station, we came across this miniature train line that reminded me of the streetcars back home. Tucked away from the main street, it is only 5 km long, and boasts some of the most colourful two-cart trains I have ever seen: mint green, sky blue, bright yellow, and magenta to name a few. Shimokitazawa and Sangenjaya are some of the oldest neighbourhoods around Tokyo. 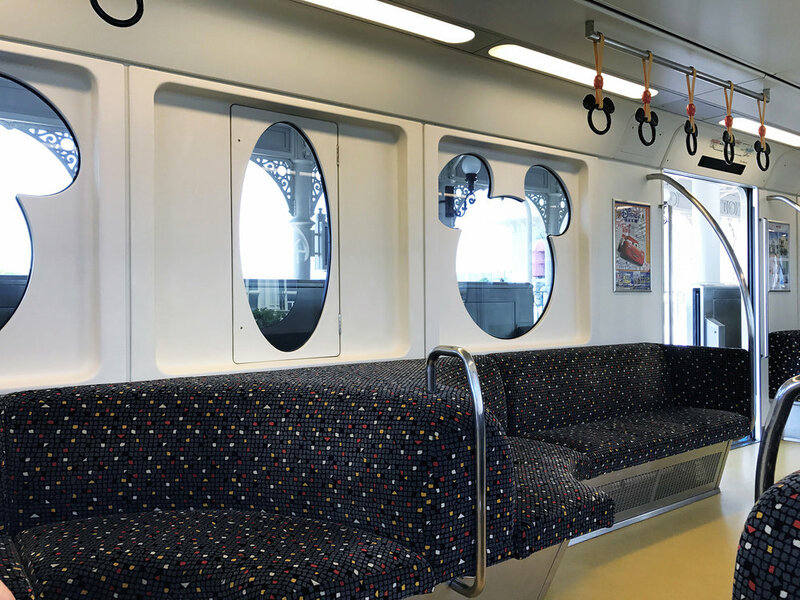 They are not too far away from each other, so choosing to commute by foot between them on a pleasant sunny day can open up a whole new side of Tokyo not available on the tourist map destinations! Summer is in full swing now. So let’s talk Japanese Natsu Matsuri (夏祭り, summer festival) culture. Or more importantly what to expect when attending one. Shinto-based matsuri are festivals dedicated to a specific neighbourhood Shinto shrine. Some are celebrated once a year, and some every two years. This is where you’ll get to see a large number of genki (元気, lively, spirited) volunteers, dressed in traditional mikoshi bearer clothes, carrying the portable shrine, while rhythmically lifting it up and down to amuse the enshrined deity. The parade lasts for a day or two, with the portable shrine being carried along the streets of its neighbourhood. There is music and “wasshoi” (わっしょい, heave ho!) chanting. Lot’s of chanting. Bearing the mikoshi is no easy task. “Wasshoi” encourages the group to keep up the rhythm and the pace, providing the necessary energy to keep up with the important task. The highlight of the parade is the return of the mikoshi to its shrine. The participants go wild, with genkiness to the max. We had the pleasure of attending the Sanja Matsuri (三社祭, literally "Three Shrine Festival") this past May on our latest Tokyo visit. Its one of the biggest mikoshi matsuri in Tokyo, taking place in the Asakusa neighbourhood that happens only once every two years. The turnout was great. Lots of food, sunlight, fun, excitement and more food. And yes, this blog was a great excuse to share our trip festival photos with the world. Hanabi (花火, fireworks) is by far one of my favourite matsuri. If you think you’ve seen a great firework display before, Japanese hanabi will top it! These people are true artisans in the craft of explosive coloured lights. I’d say it is not even as much as a celebration, but more of a competition. Think bigger, brighter, and more colourful than you’ve ever seen before. They are also longer, with Tokyo’s Sumida river fireworks being displayed practically nonstop for over 2 hours. Your visit to Japan in the height of the summer heat will definitely be worth it, if you catch one of those. There are many more types of festivals as well. Some feature dancing, music, lanterns. Some are meant to celebrate a specific cultural event, such as Tanabata. (Read more on Tanabata here.) I won’t go into detail for all of them, but I will point out the three things most of them all have in common. Yukata, (浴衣) is a Japanese light summer kimono. It comes in many colour variations, and similarly to kimono, is tied with a matching colourful obi (帯, sash). Unlike kimono, with yukata you have an option to tie the obi yourself or get a ready-made easy to put on clip-on. If you visit any of the Japanese summer matsuri, you’ll see almost everyone wearing one. It is a humble cultural experience that survived the time of change towards modernization. I highly recommend wearing one, as it adds to the experience of the summer matsuri celebration, allowing you to fully take part in all the festivities of the event. Kingyo Sukui (金魚すくい, goldfish scooping) is a game of patience, perseverance and downright luck. The highlight - if you win, you get to take the living creature home. That is if you win. Catching the fish in the pool is no easy task. First, you pay for the flat net that is made of paper. Then you must use this net to try to scoop up the fish. If you leave it in the water for too long, the paper will dissolve. If you apply too much force, the paper will rip. I won’t even go on to mention the fundamental nature of the fish not staying still in one place. I’d say one thing though: attempting to catch one is definitely the best part. Did I mention you get to keep it! For me, food is by far the highlight of any matsuri. Japanese food is known to be healthy and light. But when it comes to Japanese festival food, it is quite the opposite. Most of the real estate is taken up by pop up food stalls filled with grilled, deep fried, baked, and sweetened goodness. The menu ranges from the oh-so-famous yakisoba (焼きそば, grilled soba noodles), okonomiyaki (お好み焼き, grilled savoury pancake containing a mix of ingredients), takoyaki (たこ焼き, wheat flour-based batter grilled ball filled with diced octopus), taiyaki (鯛焼き, batter fried and filled with red-bean paste or custard fish shaped goodness), ikayaki (いか焼き, grilled squid), kushiyaki (串焼き, grilled skewered meat goodness) to my favourite jagabata (じゃがバター, baked potato served with a large helping of butter and miso paste). For desert there the skewered choco banana (チョコバナナ) - chocolate dipped banana, kakigoori (かき氷) - shaved ice with a flavour syrup of your choice, and other candy treats. I am sure I missed some. The spread is just too great to take in in one seating. かき氷 (kakigouri) - Note to self, leave the topping to the pros. Went a bit crazy on the syrup, and ended up with sweetness of a lifetime.